Today was an excellent day for my excursion to Cambridge to hear and play the street pianos. My first stop was Porter Square, where there was a nicely tuned piano out in front of the store and no one playing it. I remedied that, of course, just doing a few improvisations. A woman brought a baby in a carriage to get a close look, so I shifted into something more lullaby-like. Before that, I had a feeling no one was really paying attention, but several people expressed their appreciation as I left. Then I started down Massachusetts Avenue toward Harvard. There was a piano on the street, but the key lid was locked. A couple was standing there, disappointed. Maybe it had been locked for the night yesterday and no one was there to unlock it today. Anyway, we talked a bit and then proceeded to the Harvard Science Center. Several people were doing short bits, and it was nice to see that so many people could have fun with a piano. I finally got a turn, and so did the lady (her name was Angela), who played nicely. Next I headed for Holyoke Center and listened to a man who was playing for a good long time. After that I looked for one whose location was given as “Brattle Plaza, Harvard Square nr Out of Town News & the T.” I went over to Out of Town News, but there was no piano there. It turned out to be at Brattle Square, not really near Out of Town News. Unfortunately, its key lid was jammed so it couldn’t be fully opened, making it unplayable. The last piano I wanted to sample was at Davis Square. Unfortunately, a jerk with a guitar had set himself up right next to the piano. I’d given money to a street performer just a minute before, but this one didn’t get any from me. It was a wonderful, musical way to spend a few hours. I’ll have to come back and perhaps try some of the pianos in Boston. The site for Street Pianos in Boston has lots of wonderful features: pull-down lists, an interactive map, and a PDF map which is great if you happen to have a large format printer. What it doesn’t have is a simple list of the locations which you can print out or load onto a handheld device. People doing piano touring would find that useful, I’d think. I’ve put together a list for my own use, so here it is. I claim no copyright in this, and I’m not responsible for any errors; it’s just information taken from the original site and reformatted. Feel free to spread it around. Yesterday it took me over two hours to get from Framingham to Haverhill, a trip of about 60 miles almost entirely on Interstates. This isn’t unusual at rush hour on Friday, and it gave me lots of time to think about traffic congestion. Why does traffic slow down periodically and then suddenly speed up again with no apparent causes? I started forming a hypothesis that involved considering the events as shock waves, and today I searched for “traffic shock wave” to see what thoughts experts have had on the idea. Sure enough, it turned up quite a few relevant hits. The idea is fairly obvious: When traffic is dense enough, any slight disruption in the flow of traffic can propagate backwards, forcing many drivers to slow down. People can speed up again at the head of the jam, since the slowdown has created a relative vacuum ahead of them, but others are caught in the tail. By the time the congestion dissipates, the driver who caused it is long gone. This has been confirmed in simulations and on a test track. A refinement to this idea which I haven’t seen, maybe just because I don’t know the keywords to look for, is that once the effect starts, it should be prone to positive feedback. If a driver changes lanes in dense traffic, others must slow down to maintain distance. As gaps get smaller, people will have to brake more when someone cuts in in front of them. This makes the traffic still denser, so the next lane change has a stronger effect. If you’ve ever seen an idiot cut across three lanes in heavy traffic to get to an exit, you know just how strong it can be. Each lane change may only cost a couple of MPH, but the cumulative effect can bring traffic to a standstill. If this hypothesis is valid, you’d expect such jams to be especially common in areas where tailgating is the rule and drivers rush into any opening in a lane. Los Angeles, at least by reputation, confirms what I expect. If anyone knows of any work that’s been done on this notion, I’d like to hear about it. In just a few days, and continuing till October 14, 75 pianos will be put out in various places in Boston and Cambridge for anyone to play. Naturally, I’m in! 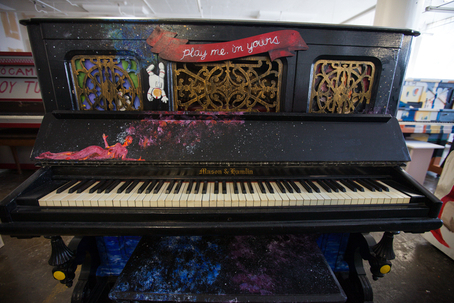 There will be six pianos in Holyoke Center, so that might be a good place to snag one. I don’t have any definite plans yet; the first day could be busy, so later on might make more sense. Here’s a wild thought: I could bring down a laptop and a DVD with a silent movie and accompany it right there. The Magic Cloak of Oz might be a good choice, since I’d only have to hold my claim to the piano for 38 minutes. Posted in General. Tags: harvard, Massachusetts, music, personal. Comments Off on Street pianos in Boston! The reactions I get from some people when I talk about supporting Alzheimer’s research are odd. They seem to say that God meant our brains to suffer debilitating damage after a certain number of years, though they don’t put it in religious terms. If you talk that language, “God” also “meant” most of us to die by the age of forty. That hasn’t stopped people from doing medical research and promoting sanitary practices that have brought us close to double that figure. There’s no more reason for us to accept the inevitability of our brains’ shutting down while our bodies are still going. September 21 is World Alzheimer’s Day, and it’s a day for reminding people how much misery the disease causes and what can be done to make it preventable or curable. Research on treatments hasn’t offered much. There’s some information on prevention; basically, if you live a healthy lifestyle and keep your mind active, you improve your odds somewhat. When we consider that the amount of money spent on Alzheimer’s research has been tiny compared to heart disease, cancer, and the like, the shortage of progress is no reason to give up. It’s a reason to put in more resources, to donate more money. My totally uneducated guess is that the best hope lies in medicines that will prevent the accumulation of amyloids before cognitive symptoms can show up. Alzheimer’s is counted as the number five or six killer of Americans among diseases, and it’s possibly the most trying to deal with (though strokes certainly give it competition). Cancer and respiratory disease at least allow some dignity to the end. The idea of having my brain gradually turn to mush scares me more than a painful end from cancer. We don’t know what it will take to reach a breakthrough, but given what’s been accomplished with so many other diseases, there’s every reason to believe medical science can find ways to cure it or at least significantly slow its progress. (Remember when a diagnosis of AIDS was a death sentence?) I recommend supporting the Fisher Center for Alzheimer’s Research Foundation. With advances in research, fewer people should have to face the prospect of having their minds go first or seeing it happen to someone in their family. The news from Washington is rarely good, so let’s enjoy it when it is. Obama tried to personally launch a war against Syria, but public and Congressional opinion was so strongly against him that he had to back away. He’s still making threatening noises, but I doubt that they’ll amount to anything at this point. For the first time I can remember, top leaders in the US government tried to start a war, only to be answered with a resounding no. I don’t understand all the reasons it happened. Hypocritical political game-playing in Congress certainly played a big part. So did widespread disgust at the Obama-approved massive spying on Americans. For those who paid attention, the fact that Al Qaeda is more on the rebels’ side than Assad’s made them wonder. The ineptitude of the administration’s case was a factor; Kerry’s claim that the attack would be “unbelievably small,” not rising to the level of an act of war, provoked gales of laughter. The issue didn’t follow party lines. It was Obama, the top leadership of both parties in Congress, and the major news media against almost everybody else. For the moment, we can just laugh. If you did anything at all to oppose O’Bomber’s scheme, you’re entitled to join in the laughter. If you kept quiet or you’re promoting the whitewash to insure your Obamagoodies keep coming, you get to join too — on the receiving side. There’s always boom tomorrow, but let’s laugh while we can. For something completely different, I’m posting one of my keyboard improvisations. I just do these now and then, mostly for myself, and perhaps it will interest a few people. There should be a player visible below. I’m having some trouble getting it to work in Firefox but it’s visible and functional in Safari. There’s a group in Nashua that stands in front of the City Hall at 11 AM every Saturday to protest whatever war is current. They’ve been there since the Bush years. Yesterday I decided it would be a worthwhile gesture to stand with them, so I headed downtown. The group has dwindled down to two people. I hoped there would be a boost in numbers because of Syria, but apparently the old regulars have wandered off and they haven’t been bringing in new people. That happens with a lot of organizations. It was still an interesting way to spend an hour. One of the two men was a liberal sort; the other described himself as libertarian-leaning. The second was also a 9/11 truther. I’ll listen to anyone’s arguments if I don’t have something better to do; even if they’re nonsense, I’ll learn something about how they think. He claimed to be a chemical engineer and to have concluded from a personal analysis of some of the debris that the towers collapsed from set explosives, not from the impact of the airplanes. Now I know that cell phone use is prohibited on airplanes partially because a phone would have a line of sight to multiple towers and could put an undue burden on phone traffic. Also, I’ve played enough with shortwave radio to know that there are no hard limits on radio distance. I’ve picked up AM broadcasts from distant parts of the US. Today I learned in a web search that most if not all of the calls from Flight 93 (the one that crashed in an unpopulated area) were made from airplane phones, not cell phones. An article by a 9/11 skeptic supports this conclusion, as do other sources. My biggest complaint about the 9/11 truthers is that they offer no coherent alternative. How could any group within the government make Bin Laden a stooge in their plan, plant explosives enough to destroy the WTC, and arrange the hijackings? Why would they bother crashing a plane in rural Pennsylvania and faking phone calls from it? I don’t doubt that there are people who’d have killed thousands for the sake of gaining power and profiting from the actions that followed, and the NSA scandal has shown how deeply dishonest our government can be, but the scenario just doesn’t make sense. At any rate, I can say I single-handedly boosted the turnout against bombing Syria by 50%!